How do I calculate the Terrain Ruggedness Index for each county in the United States in R? I have a shapefile of US counties and high-resolution elevation data that spans the entire contiguous United States. My goal is to calculate a terrain ruggedness index for each county. The functions (that I've been able to find, e.g. spatialEco::tri) all take raster layers as arguments. but obviously these calculations aren't happening strictly within each county. 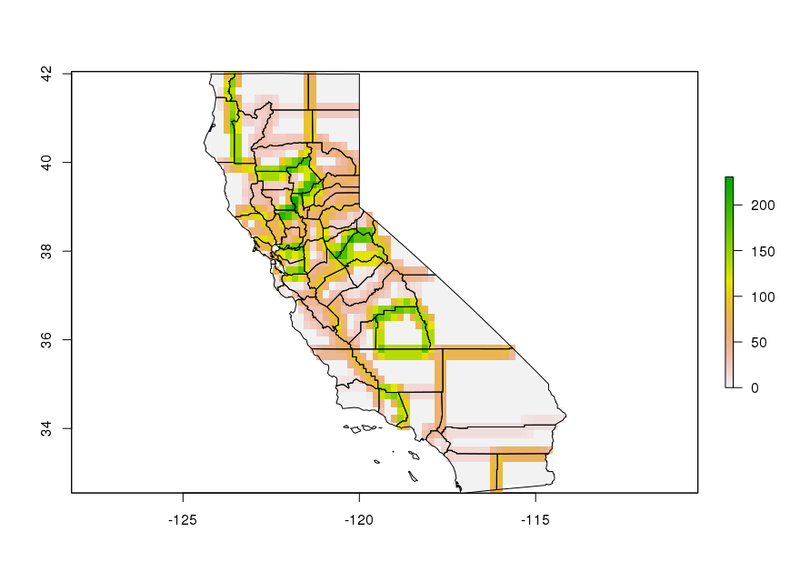 How do I apply a function (like tri) that takes a raster layer to the raster that's contained within each county individually? Once I have that, it's easy enough to calculate the mean TRI across all cells within the county, for example, using the same zonal statistics approach described above? Just because something is published does not mean that it is necessarly correct. In this case aggregating the TRI to a county is certainly incorrect. The distributional qualities of the metric, in relation to inference, become meaningless. Given the linked journal, bad dogs! You are functionally taking the mean of a derivative metric that represents localized mean deviation. I would highly recommend reading up on MAUP, perhaps starting with Cressie's "Change of support and the modifiable areal unit problem" and ecological fallacy in spatial data by reading Wakefield's "Spatial Aggregation and the Ecological Fallacy". Since the basic idea here is to identify topographic variability within an experimental unit to indicate "ruggedness", one could address the underlying distributions directly. Since highly relieved areas would also be expected to exhibit highly skewed, standard Gaussian moments may not be adequate. You can step out into non parametric statistics such as Median Absolute Deviation from Median (MAD). Here is an example of what I am getting at and some potential solutions. First, let's calculate the pixel-level TRI and calculate the mean for each county. You can see that the variability is not correctly represented, at least not visually. Now we can calculate the MAD by passing the function directly to raster::extract. We can also write a global approximation of TRI using the median and the deviation value. This actually looks fairly reasonable and is comparable to MAD. Although, it did pick up Frenso county as very high ruggedness (which spans the southern Sierra's) whereas MAD did not. Edit and disclaimer: Please see Jeffrey Evan's comment above. Below you will find a computational solution to OP's question, but users should be aware of the consequences of deciding to aggregate something like TRI across broad spatial scales. Edit: Here's a way to quickly apply the function to a state-level shapefile that has county information. Note that I switched the order of the arguments in the original CountyTRI function so that it can easilty be used in lapply. You'll need to replace NAME with whatever title the name column in calif has. Not the answer you're looking for? Browse other questions tagged raster r elevation terrain sf or ask your own question.